In 2010, the California Education Roundtable Intersegmental Coordinating Committee was awarded an i3 Development grant for STEM Learning Opportunities Providing Equity (SLOPE). In 2015 as the SLOPE grant concluded, the ICC used findings from the implementation and impact studies to modify the intervention. The revised intervention — Applying College and Career Equity-based STEM Strategies (ACCESS) — is a comprehensive professional development package of services designed to help secondary school teachers apply research-based college and career equity-based STEM strategies in the classroom and to support effective teaching of rigorous state standards and core competencies in math. A grant was written by the Alliance for Regional Collaboration to Heighten Educational Success (ARCHES) and the Madera County Office of Education using the ACCESS model. The greatest percentage of improvement for the cohort on Number Concepts and Operations performance from pre- to post-assessment on the University of Michigan Learning Mathematics for Teaching (LMT) for cohort 11 were reported by the state evaluation team. The change was listed as statistically significant. The recent WestEd study (Gallagher, 2016) found that ACCESS might be effective in improving student achievement in math in high-needs, demographically diverse schools. Students who received ACCESS services demonstrated significant growth as measured by MDTP tests from fall to winter in the 2016-17 school year. 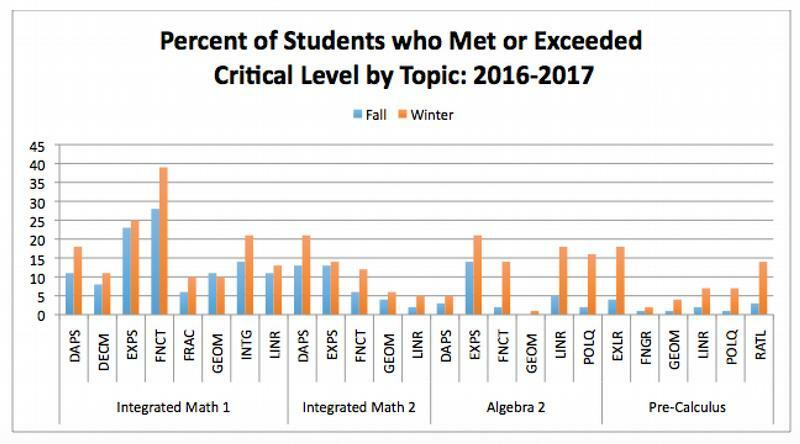 Sixth grade students who took the same MDTP test in fall, winter, and spring in the 2016-17 school year increased by 10 percentage points from winter to spring of 2016–17 and 15 percentage points over the course of the school year (fall to spring). The impact study of SLOPE is included in the What Works Clearinghouse. Evaluators found a relationship between implementation fidelity and student test scores; students in classrooms taught by teachers with high-fidelity ratings outscored students in classrooms taught by teachers with low-fidelity ratings. SLOPE was rated as “Meeting What Works Clearinghouse Standards with Reservations” because reviewers were concerned about a potential “joiner effect,” due to differences in which students were assigned to classes. Graph 1: Comparative data for gap closure. Increases ranged from 6%-63% within a single year. The above graphs are two among several that document student gains, course gains, etc. of work done in urban high schools. ACCESS has had a huge impact on teaching and learning at Valley High School. Nearly a year ago, we began our discussions with Ms. Twitty and Ms. Fisher to craft a program that would allow Valley mathematics teachers to create learning experiences that create high ceilings and low entry points for students and incorporate equitable teaching practices. From the beginning, one of the hallmarks of the Access program has been the flexibility of the directors and the collaboration between their content area experts and our curricular leadership. Over the course of the five days of training, our teachers have been presented with true experts in the fields of intervention, assessment, and mathematics, and have been challenged to develop as professional educators. Monthly phone conversations between site personnel and the directors have allowed us to guide the implementation and focus on areas of need as they emerge. Monthly site visits provide Access personnel with first-hand knowledge of implementation, which they are able to reflect back to teachers over lunch, but have also provided a forum for focused discussions between Access experts in critical areas and site leadership. Ongoing coaching through an online platform has provided teachers with a continuous source of judgment-free curricular advice and a persistent reminder of the ideals of the REAL model. Our initial results show a drastic decrease in the number of students failing both Math I and II and a significant increase in average math knowledge in the students of participating teachers. We are excited to be finishing up our first year of receiving Access coaching, but we are even more excited to be entering our second year of support to develop even further as educators. I didn’t get the chance to thank you for two years of excellent professional development that I will use to serve my students as I shift to common core. This was one of the best PDs that I have attended! I plan to start with conceptual understanding before procedural fluency but maintaining a balance. I plan to use my lesson plan design to build lessons prior to and after that connect and guide students to where I want them to go. Today I gained a great understanding of how to connect conceptual understanding and procedural fluency. The reading got me thinking and then Ivan’s activities helped me realize the importance of connecting the two and strategies to be able to do so.